“How can we make solar power affordable, viable? Pay people for it,” an op ed I wrote about solar energy policy in Maine, was published in the Bangor Daily News this week. Several interesting questions and concerns came up in comments. Many of them related to the specific costs of our system. For anyone who would like to know those details, here they are. One commenter asked about our financing. We used a home equity line of credit with a 30 year term and a 10 year draw, at a 2.74% variable rate. We are actually only paying interest, deferring principal payments, but I’ve included both principal and interest to give us a full picture of our loan obligation. One of the points of my op ed is that such low-interest financing or ability to pay cash for solar energy systems is not available to every Maine family. The policy question is, Do we want to make solar more affordable for more families? In addition to a photovoltaic system on the south side of our roof, we have a solar hot water system on the north side. 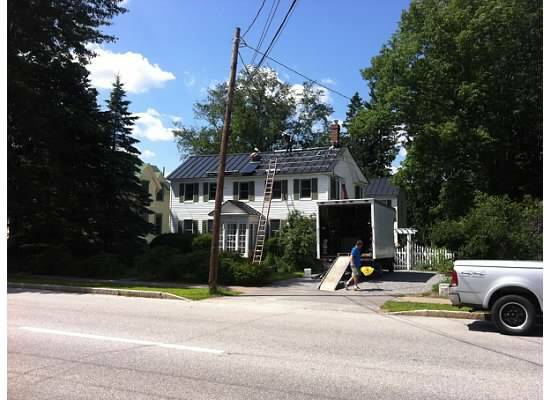 The above data explain why more photovoltaic systems and fewer thermal systems are being installed in Maine. The warranty period for PV is 25 years versus 15 for thermal, which has a dramatic impact on the total value of the systems. The reason PV systems can offer longer warranties is they have no moving parts, whereas thermal systems have pumps to move antifreeze. In my solar thermal calculations, I have made the very optimistic assumption that we obtain value from all the energy we collect. This is not likely. In the summer we probably have excess energy that we cannot use because our hot water tank is already at temperature, and we cannot send our extra heat to our neighbors. In contrast, when our PV panels generate more electricity than we can use, we can share that with my neighbors over the grid and get net energy billing credits for it. Many families are choosing to install heat pump water heaters that use electricity. When combined with solar PV, these offer a fantastic long-term value. The reason we installed solar thermal and not more PV is that we wanted to use both the south side and the north side of our roof to harvest the maximum possible amount of solar energy. The evacuated tube solar thermal collectors are able to be “tipped up” and installed on the north side of the roof, while the PV panels lie flat on the south side. The problem with tipping up PV panels on the north side is that they would trap snow and catch the wind. Evacuated tubes can have the bottom portion in snow and allow wind through. You mentioned in an other comment you generated 454 KWH. It seems very low for August based on 7.71 KW of capacity but did you consume all the power or is it a mix of consumption and sales which were netted against your bill? Do you have a breakdown of consumption and excess power sold? Are both your PV units hooked up to the grid? Did you do a sensitivity scenario analysis comparing SO versus the “use plan”? The 454 kWh in August is electricity that we did not consume on site and was recorded by CMP’s outgoing meter on our house. Solar electricity consumed “behind the meter” does not show up on our power bill. Our inverter records all of the energy flowing through it. So I could calculate solar electricity consumed “behind the meter” by taking a reading from my inverter and subtracting the reading on CMP’s outgoing meter. But for my purposes, periodic checks on the inverter (when I happen to be down in the basement) and CMP’s bills give me enough information to determine whether my system is working properly. Most people think about power ratings on solar thermal systems in terms of BTU per hour, but I’ve used watts since that allows easier comparison across all of our energy systems. We have 3.43 kW of PV on our south roof and 3.888 kW of thermal on our north roof. The thermal output is circulated inside using a pressurized glycol loop. A heat exchanger in our hot water tank transfers this energy to our domestic hot water. I did do a sensitivity analysis comparing the standard offer to the time of use plan. Our Nissan Leaf electric car comes with a timer that allows us to program when it charges, so we take advantage of the lower electricity prices for that. We have an old house (built in 1828). We did air sealing, added significant insulation in the attic and walls, and installed radiant floor heat on the first floor by putting up aluminum fins and tubing on the basement ceiling. At night our electric boiler heats up our entire first floor by circulating warm water in the aluminum fins on our basement ceiling, using lower-cost energy at off-peak times, so that by the time we wake up our house is up to temperature. During the day the heating system typically does not run. We pay less for electricity under the time of use plan than we would under the standard option plan. I looked at my [electricity] bill. I pay no separate fixed monthly service fee. Your service fee is another added expense for your system and nowhere near covers the true cost. On a residential time of use bill in CMP’s territory, you’ll see a line called “service charge.” This service charge was on my power bills before I installed solar panels, and has remained on it since then. On a CMP standard office bill you’ll see a line that says, “Delivery services up to 100 kWh.” You’ll pay this fee regardless of how much power you use. I don’t know how other utilities label this fee, but I believe that every electric utility in Maine charges a minimum monthly service fee. You may be right regarding true cost. I believe the rate case filings would include some estimates of the median and standard deviation of the cost to provide service. My house is in a downtown area so I’m guessing the marginal cost to provide service to us is actually quite low. I don’t think you have come to grips with the fact that PV generated electricity is much more expensive [to] produce. It doesn’t matter who pays for it, but somebody must. The tooth fairy won’t be paying for the increased cost. In the end, when it [costs] more to produce somebody pays. Cheap PV panels have been just around the corner for the last 25 years. You also haven’t addressed the cost of storage of power for off hours which is more expensive than the generation. The concept of a feed-in tariff is to spread the cost of generating electricity with PV across rate payers over 20 years. Due to the dependable nature of the energy source (the sun) and the inherent reliability of the panels (no moving parts), it reasonable to expect that PV equipment will produce power for the warranty period, which is typically 25 years. Any generator that buys fuel cannot realistically guarantee their cost of producing electricity over 25 years. It is an open question whether PV electricity will be much more expensive than natural gas electricity over the next two decades. In my household, we could store solar power in our car. The Nissan Leaf has a 24 kWh battery. It is possible to buy an inverter kit to allow this battery to be used to power household appliances. We don’t do this, however, because all of the power we generate during the day is used in our neighborhood to power refrigerators, computers, microwave ovens, coffee pots, lights, etc. The most cost-effective grid-scale storage options today are pumped storage. Maine could develop these because we have the water and the terrain. Other options for pumped storage include bladders on the sea floor and salt caverns. Many research groups are studying how to transition to 100% renewable energy systems. We lobby the government that is self interested in providing subsides to fossil fuel players to get subsidies for clean energy. This does not sound very effective. There is an international organization that sees the problem in the same light as you do. 350.org is pursuing a divestment campaign to “to loosen the grip that coal, oil and gas companies have on our government and financial markets, so that we have a chance of living on a planet that looks something like the one we live on now.” The idea is that a successful divestment campaign would allow policies like feed-in tariff to get fair consideration. Would you kindly provide proof that “we will have more choices for the clean energy technologies available to buy [if] we pay taxes”? My conjecture is that well-invested taxes have the potential to provide break-throughs in clean energy technologies that would otherwise not occur. Simply paying taxes, however, is no guarantee that we will have more technology choices. We need to collect taxes and to invest that money wisely. Solar photovoltaic panels would not be available today if past generations of United States tax payers had not provided the research and development subsidies that allowed the basic science to be pursued and the technology to be brought to market. History teaches that the investment horizons of private actors in competitive markets are too short to provide the resources necessary for sustained basic research programs. Successful large-scale basic science has been pursued with funding from large monopolies or governments. So if we want new technology choices, either we pay large rents to monopolies to allow them to devote resources for long-term research projects or we pay taxes for government-supported basic or applied research. Low efficiency is an interesting point. If I buy 50 [DIY] solar collectors that produce the same as 30 collectors for $4,000 less, I do not see the importance of efficiency when weighed against affordability. More people afford the tech, the less use of fossil fuels. This idea of a standard seems to be a stumbling block at least with this idea. People with outstanding engineering and construction skills can design and build home-grown solar thermal collectors that work. Other people can’t. It is actually quite difficult to build your own low-cost collectors that can withstand years of freeze-thaw cycles and maintain their integrity. That is why standards are a good idea if we are paying rebates: we want to reduce tax-payer or rate-payer risk of paying for systems that don’t work. It would be too costly and time consuming to examine every home-built system to determine if it will work for more than a few weeks. With today’s technology it is not possible to build your own photovoltaic system, except in the limited sense that if you can find a source of photovoltaic material (such as reject panels from a manufacturer) and an inverter you can put together your own balance of system (frames, cover, wiring, mounts, etc.). A feed-in tariff shifts the risk to the installer and owner of the power system. If you can’t build a system that reliably produces power, you don’t get paid. A feed-in tariff, unlike a rebate, is a “performance-based” incentive. Competition in the marketplace has historically set higher standards while govt. favors or subsidies lower standards. This, I believe ( and I know I do not have all the answers and am willing to bounce ideas and knowledge around to get a better idea/concept), applies to research and development. If I get a check but don’t produce (govt subsidies) or must produce for return in investment (private), I believe we would be further ahead. I hate to use this example but the medical industry demonstrates this. NIH is way behind everyone in this field. The NIH invests over $30.9 billion annually in medical research for the American people. More than 80% of the NIH’s funding is awarded through almost 50,000 competitive grants to more than 300,000 researchers at more than 2,500 universities, medical schools, and other research institutions in every state and around the world. About 10% of the NIH’s budget supports projects conducted by nearly 6,000 scientists in its own laboratories, most of which are on the NIH campus in Bethesda, Maryland. Setting aside the NIH as an example and returning to the energy market, I understand your point to be that we would be better off to allow competition rather than to subsidize a particular type of electricity generation through government action. I think the key issue is whether or not you believe there is a market failure that the government can correct. I believe there are two market failures that should be corrected. First, we have not included real but hard-to-quantify externalities in the cost of generating electricity from fossil fuel. This is an intractable problem because the information costs are too high. We can’t measure and add up the actual costs of burning fossil fuel because it would cost too much to acquire that knowledge and because we can’t agree on how to quantify those costs. Second, there are huge transaction costs associated with developing Maine’s vast clean energy resources. A standard contract would eliminate the costs of negotiating individual contracts for every roof in Maine. A feed-in tariff would be a simple way to fix market failures so that we can maximize public benefit from our energy market. See your point in selling back the energy. There will be push back if it becomes prominent and then more restrictive regulations. Suggest homes just being energy independent for now. [Set] up a non profit at state level for each state to attract private and/or foundation funds for people to [generate] more clean energy. People who receive the help to do this financially, pay back the amount on a monthly basis that is affordable to them and the returning funds are re-invested into the next home. Seems the most cost efficient and effective way of doing this. It is less cost efficient and less effective than a feed-in tariff, which is why most other countries have adopted a feed-in tariff. This entry was posted in Sustainable Living on November 9, 2013 by Fred Horch.